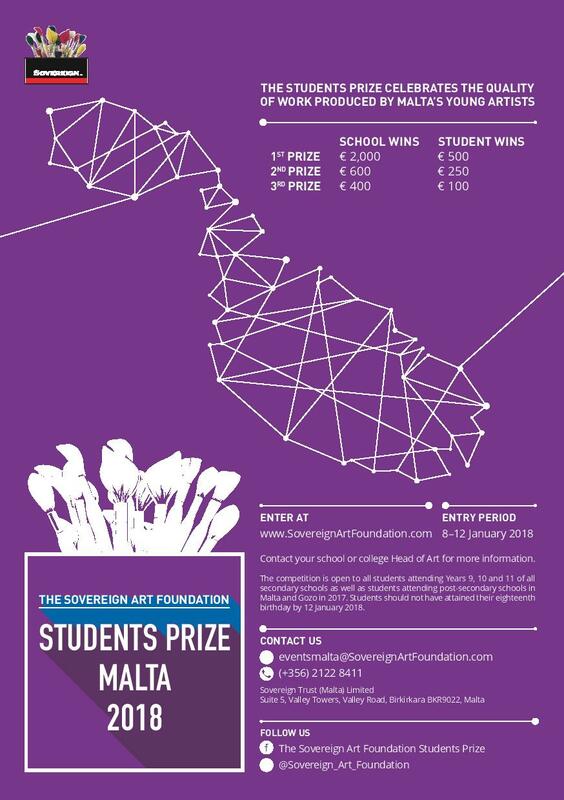 Sovereign Trust (Malta) Limited, part of the worldwide Sovereign Group, in association with The Sovereign Art Foundation, announce the launch of the inaugural Sovereign Art Foundation Students Prize in Malta. The competition aims to celebrate the importance of art in the education system and recognise the quality of work which can be produced by local students. All local secondary schools and colleges in Malta and Gozo have been invited to participate. The invitation to take part in the Art Prize was issued by email to all secondary schools and colleges on 2nd October by the Ministry for Education and Employment. Schools participate by nominating and submitting five of the best artworks produced by its students. Of these, 12 pieces will be shortlisted and three winners will be chosen. All entries will be viewed by an international judging panel, which will consist of senior Sovereign personnel, including Howard Bilton, Chairman of the Sovereign Group, Stephen Griffiths, Managing Director of the Malta office, Robert Zahra of the Malta School of Art and local artists. Finally, the public will select three winners by either voting online or at exhibitions of the shortlisted works which will be held in Malta. The three winners will win monetary prizes for themselves and their schools, which will be presented at an award ceremony to be held at the end of March 2018. Entries will be accepted from 8 to 12 January 2018. The Sovereign Art Foundation is a charity established in 2003 by Howard Bilton, and funds projects using art as education, rehabilitation and therapy for disadvantaged children throughout the world. Since its inception, the Foundation’s Art award has become the largest in Asia, and the charity has raised over $5 million for charities worldwide. The Sovereign Art Foundation has run student prizes in Hong Kong, Singapore, Bahrain, Mauritius, Portugal, Guernsey and the Isle of Man.